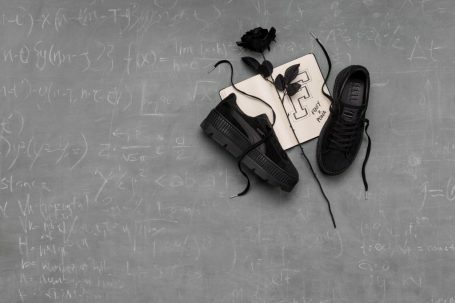 Global Sports Brand, PUMA, and FENTY Creative Director, Rihanna, officially ushers in the third season of FENTY PUMA by Rihanna by opening up the doors of FENTY University, where varsity sport gets a high fashion makeover and everyone can mix and match the variety of looks. Rihanna designed the collection to represent different youth cultural cliques and their unique styles that set them apart in hallways and locker rooms – Nerds, Jocks, Skaters, Preppies, Goth kids and of course, Bad Gals. Lending her signature FENTY style, the collection features chunky hand-knit sweaters, chenille PUMA Cats and varsity F’s adorned rib knit sweaters and dresses, over-sized coats in faux sherling and furs. Classic uniforms and track suits were reinterpreted with technical sport fabric and fashion touches serving up elevated Ivy League-style. Signature branding details appear throughout the range most notably Rihanna’s lucky number 13, badges representing her birth year 1988, the FENTYxPUMA piercing zipper and FENTY PUMA branded buttons and trims. Unique patches, hardware and sporty taping enhanced the collection’s sport theme even further. Rihanna made sure she did her homework by choosing the right accessories to compliment the university-ready looks. Bags took on diverse forms and shapes from over-sized teddy bear bags, vanity cases to envelope bags. Headwear comes in a variety of styles from puffer caps, varsity baclavas and durags. Varsity scarves and chokers serve up school squad feels. Last but not least, the collection’s footwear range instantly puts you on the honour roll of style. Get ready for new-to-cop styles and future icons – Chelsea Sneaker Boot and FENTY Trainer Hi and Knitted High MaryJane Heel. The iconic PUMA Creeper makes a solid comeback in two new stacked sole iterations – the Cleated Creeper Suede and the Anke Strap Sneaker available in women and men’s sizing in the latest seasonal colors. Shop the PUMA Cleated Creeper Suede starting August 31st and the collection beginning September 28th, available on PUMA.com, PUMA stores and leading fashion and lifestyles retailers worldwide.